Reliance Precision offers a wide range of motion control solutions, including hybrid linear actuators engineered using custom thermoplastics and incorporating stainless steel leadscrews. Complementing Reliance’s standard range of gears, couplings and hardware products, these low maintenance actuators are quieter, more efficient and more durable when compared to standard Acme thread and bronze nut configurations. 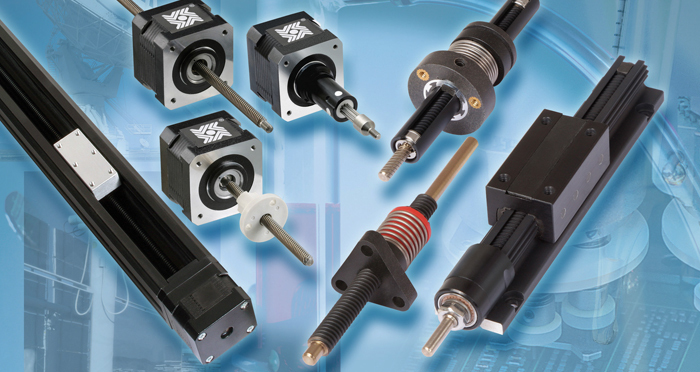 Captive, non-captive and external shaft leadscrew actuators allow the conversion of rotary to linear motion to occur within the motor by means of an integrated motor and nut. Zero transmission of error is a benefit of this design which eliminates the need for shaft coupling or shaft and pulley arrangements. Reliance can supply linear actuators that are ideal for high performance, accurate transfer of motion within a small working envelope. Typical applications include X-Y tables, medical and scientific instrumentation and other applications that require a combination of precise positioning, rapid motion and long life. The hybrid linear actuators are available in NEMA frame sizes 8 to 34, with the size 34 (87 mm2) able to produce up to 222 N of force. 400 full steps per revolution are programmable, as are stepped increments down to as little as 0.003 mm. Bespoke designs can be modified to meet specific application requirements and Reliance Precision has a manufacturing and assembly capability to suit customer requirements. Contact sales@reliance.co.uk for product information, design support and custom solutions.